The 2016 presidential election was unlike any other in American history. Polls tell us that millions of American Catholics who care about moral issues and who descended from immigrants supported Donald Trump. Why didn't Trump's rhetoric on immigration and his promises to close the borders trouble more American Catholics? Steven P. Millies uncovers the history of how and why the so-called "Catholic Vote" went the way it did in 2016 and offers some practical reflections on ways to put Catholic faith to better use in American politics. Steven P. Millies is associate professor of public theology and director of The Bernardin Center at Catholic Theological Union in Chicago. He studied politics at The Catholic University of America and has written widely about Catholicism and American politics. He is the author of Joseph Bernardin: Seeking Common Ground (Liturgical Press). "President Trump's Catholic supporters descended from immigrants we used to call `white ethnics.' So, the white Catholic embrace of Donald Trump in 2016 raised eyebrows in the Church and among political and cultural observers. Whether you find this development exciting or embarrassing, Professor Steven Millies explains how and why it happened with rigor and insight. Drawing on his years of careful learning and study, Millies has written an important book on the Catholic vote in the Trump Era." "This book aims to cover a broad range of issues and does so exceptionally well." "Though often labelled the 'swing vote' in US national elections, the Catholic vote has long confounded political analysts. That has never been more true than since Catholic voters helped anchor Donald J. Trump's unexpected 2016 presidential victory. Millies skillfully puts the Trump victory in the context of a nearly half-century long evolution of Catholic voting, and in so doing he showcases more clearly than others what underlies the motivations of politically-engaged Catholics. Much more than a conventional political analysis, Millies's book goes deep into Catholic history, tradition, and theology to provide a deep understanding of the various forces that drive Catholic voting. Highly recommended." "There is a compelling story to be told from Roe to Trump, and Millies does it well. What Millies demonstrates most strongly is the gap between church officials and laypeople." "Good Intentions traces recent US Catholic history to illuminate the contours of the contemporary public church and present political moment. Steven Millies's engaging narrative deftly navigates enduring tensions at intersections of theology, law, and politics in view of the impact of cultural and religious polarization in the postconciliar church. His subtle, interdisciplinary analysis offers valuable insights into questions of conscience, political engagement, and Catholic identity that will prove helpful to those interested in a forging a path forward beyond the binary thinking and divisive patterns he identifies." "The American Catholic population has never been more divided: half voted for Donald Trump while half voted for Hilary Rodham Clinton. How did our divisions become so deep and bitter? Steven Millies's perceptive history allows us to make sense of the past, and to move toward common ground in the future." 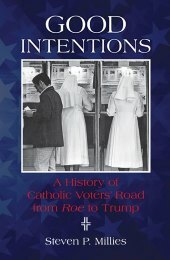 "Good Intentions should be required reading for those who want to understand the complex and unique history of the relationship between Catholics and politics in the United States, from Roe v. Wade to the election of Trump. Millies's book will greatly help our understanding of the dramatic expansion of the gap between liberals and conservatives in these last two decades, especially within the wider context of the history of the intra-Catholic division in American cultural and political life."